The heat exchanger (HX) finds numerous applications throughout the wide spectrum of industry. a. Design thermal load calculation through energy balance equation: The heat balance calculation equation is used here to find out the design heat load or cooling load value, this is the amount of heat to be removed (or added) by the heat exchanger. Typically the design heating (or cooling) load is expressed in terms of kilowatts (KW). b. LMTD calculation: The log mean temperature difference (LMTD) is calculated based on the required inlet and outlet temperatures to/from the heat exchanger. 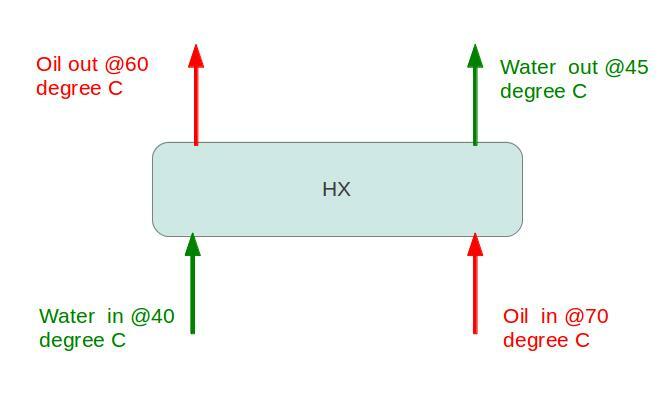 c. Required heat transfer area calculation: The design heat load value and the LMTD value is used in the final step of the heat exchanger sizing calculation t find out the minimum required surface area. what would be the LMTD? Use the LMTD equation discussed in the article (eq.2), you will be able to solve it by yourself. I don’t follow your LMTD. The result of 0.223 doesn’t equal the left hand side of the equation but only the denominator in the example above. Also for the SI unit of power shouldn’t it be in Watts? Therefore multiplying 420 by 1000. Giving final answer of 9.36m^2.